OpenCV supports for detecting mouse events. Mouse events include mouse clicks and movements over an attached OpenCV window. It is very simple to do that. 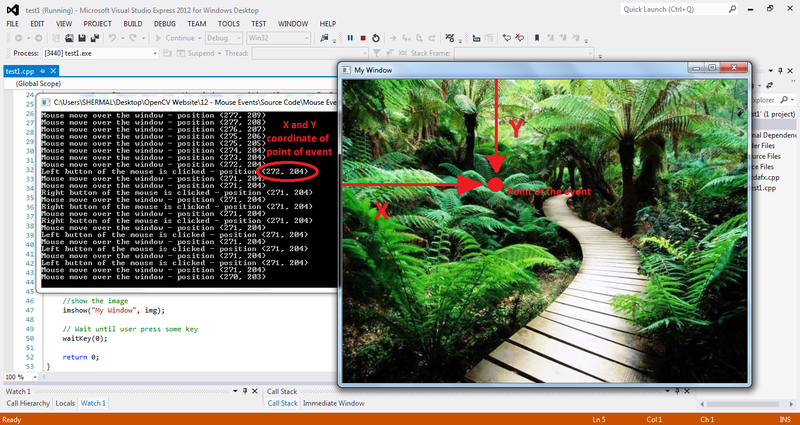 All you have do is to define a callback function in the OpenCV C++ code attaching to the OpenCV window. That callback function will be called every time, mouse events occur. That callback function will also give the coordinates of the mouse events. (e.g - (x, y) coordinate of a mouse click). In the above OpenCV sample code, "CallbackFunc" function will be called on any mouse event (Moving a mouse over the attached OpenCV window is also a mouse event). By using suitable if - else blocks, I printed only left, right and middle mouse clicks and mouse movements over the window. Here are new OpenCV functions, found in the above example code. If you are not familiar with the other OpenCV functions as well, please go through the other lessons in this tutorial. This function sets a callback function to be called every time any mouse events occurs in the specified window. Here is the detailed explanation of the each parameters of the above OpenCV function. flags - Specific condition whenever a mouse event occurs. See the next OpenCV example code for the usage of this parameter. Here is the entire list of enum values which will be possesed by "flags"
I am going to explain you how to detect a mouse event while pressing a key of the keyboard. The following OpenCV example code will detect left mouse clicks while pressing the "CTRL" key , right mouse clicks while pressing the "SHIFT" key and movements of the mouse over the OpenCV window while pressing the "ALT" key. You can download this visual C++ OpenCV project from here. No new OpenCV functions in the above example. If you have some doubt about any OpenCV functions in the above example, please refer to previous lessons. How can i create a GUI for image processing application with C++?